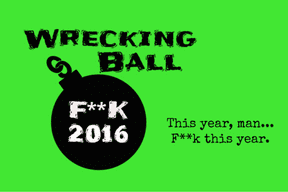 Join Vermont theatre and performing artists at Off Center for the Dramatic Arts on December 17, 7:30 PM for the first ever Wrecking Ball Vermont. Local writers and performers (including Chris Caswell, Genevra MacPhail, Dennis McSorley, and Mary Beth McNulty) each aim their work at exploding and exploring the chaotic world of 2016 through a series of short performances. Tickets are entirely Pay-What-You-Can, first come, first served. All proceeds from this event go to the Vermont chapter of the ACLU. Doors open at 7:00, performances begin at 7:30. Thursday-Saturday, December 8, 9, and 10 at 7:30 p.m.
Sunday, December 11 at 2 p.m.
Boston Marriage is set in a late Victorian Boston drawing room, the scene of much backbiting wit from Anna (Roberta Harold) and Claire (Mary Scripps). Anna is being kept by a married man, but she prefers the company of women. Claire, Anna's lover, has become infatuated with a much younger woman whom she hopes Anna will help her seduce. As the two women exchange barbs and take turns taunting Anna's hapless parlor maid, Catherine (Naomi Ruth), Claire's young crush suddenly appears, setting off a crisis that puts both a valuable emerald and the women's futures at risk. To this wickedly funny comedy, Mamet brings his trademark tart dialogue and impeccable plotting, mixed with double entendres and vernacular expressions, to explore the relationship between the two women and their maid. Through humor and nuance, the play explores the negotiation, conflict, compromise, and reconciliation that arise in their relationship. 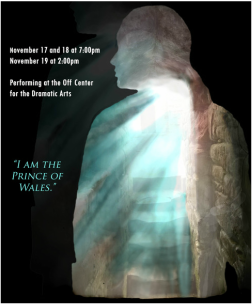 November 17 & 18 at 7:00 p.m.
November 19 at 2:00 p.m.
Set amidst a time of war in the late 1300s, Shakespeare’s Henry IV, Part One tells the story of Prince Henry (Hal), the unruly crown prince of England, on his journey from childhood to maturity as he frolics with friends and avoids his princely responsibilities. With his best friends, including the old thief, Falstaff, he plans much merrymaking and adventures, against his father's wishes. As tensions rise between King Henry IV, Hal's father, and the young firebrand, Hotspur, a new rebel of the court, Hal steps up to accept his role in the coming civil war. In the final showdown, Prince Henry must finally decide what it means to grow up. The Hour-Glass Youth Theatre is a small group of youth actors (ages 12–15) who all have an appreciation for Shakespeare and desire to bring new messages to an old work. Henry IV, Part One will be the company’s first show. The show is an adaptation of Shakespeare’s original text, with a vital message about how growing up doesn’t have to mean losing your childhood. The insufficiency of academia, the misunderstandings of long friendship, and the existential dilemma of the search for knowledge are explored when Elise and Patty are called to France to parse the papers of the medievalist mentor of their earlier lives, where they find a young woman who may or may not be a housekeeper, and a mystery which might not exist. Small Potatoes Theater is proud to present The Other Middle Ages, a new one-act play by Emer Pond Feeney. 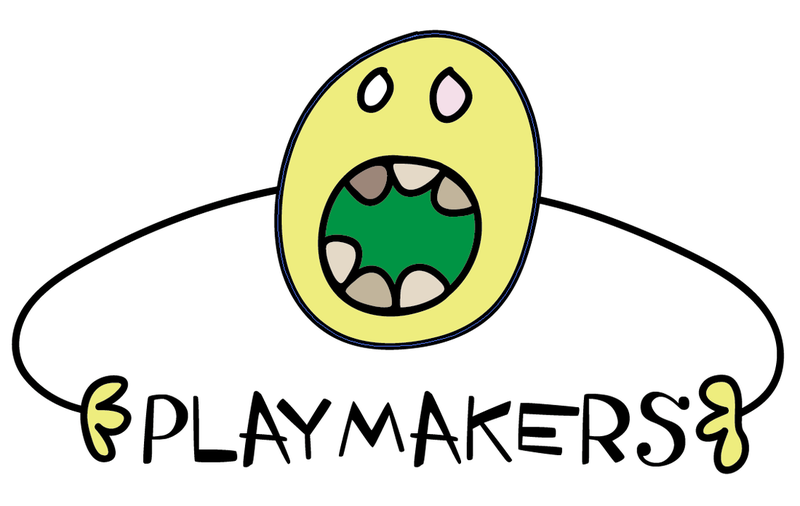 Small Potatoes Theater is committed to creating and producing enlivening theater with an emphasis on the original. Co-directors Pamela Formica and Emer Pond Feeney are long-time participants in Burlington's theater, music, dance, and literary scenes. "The Toothbrush: Tips to Start Your Day" is a loose adaption of the play "The Toothbrush" (El cepillo de dientes) by Argentine playwright Jorge Díaz. The piece demonstrates the absurd conversations and dialogue exchanged during an ordinary day in the life of a married couple, He and She. Beginning at the breakfast table, the mounting dialogue and situations gradually lead to an inevitable collision of each character’s point of view over coffee cups, forks, and some slices of toast. But the overall theme takes us through the monotony and boredom in their life, portrayed on stage through humor, irony, and the absurd. 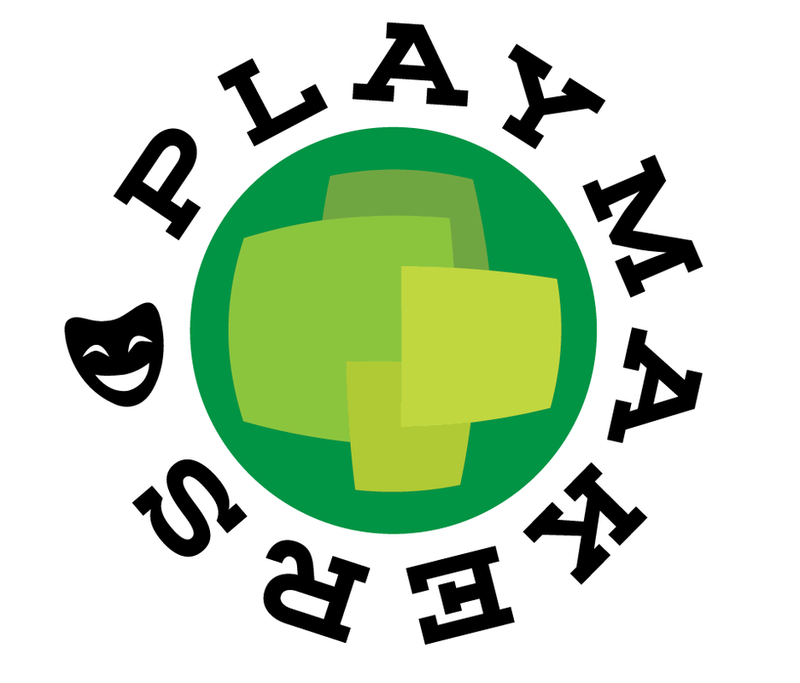 The main objective of this production is also to highlight “playing” as an outlet from the daily frustrations in life, and indicate the origin of theatrical expression. To purchase tickets in advance for the English performances, Click HERE. To purchase tickets in advance for the Spanish performances, Click HERE. near the corner of Archibald and N. Winooski Ave. (with plenty of free parking). For Reservations (strongly recommended) at BrownPaperTickets, click HERE. Limited Tickets available at the door 1/2 hour before show time, first come, first served. Celebrating Vermont theater artists who create original theater, Off Center for the Dramatic Arts presents the Fourth Annual Burlington Fringe Festival featuring the work of 24 Vermont performing companies and individuals appearing on a schedule spanning 4 nights. Over 40 performers will take the stage in a fast-paced whirlwind of shows, featuring dance, comedy, drama, performance poetry, puppetry, musical theater, and genres of performance as-yet unnamed. The Fourth Annual Burlington Fringe Festival is a benefit for Off Center for the Dramatic Arts, Burlington’s Non-Profit, 65-Seat Black Box Theater, dedicated to providing theater space at reasonable rates to area theater artists and audiences alike. For more info about Off Center and the Fringe, contact us at offcenterfringe@gmail.com. The Town Hall Theater Young Company will perform an inventive and hilarious retelling of Alice and Wonderland on September 17 at 7pm and September 18 at 2pm and 7pm at Off Center. It recently opened at Town Hall Theater to packed audiences and enthusiastic crowds. The adaption was created under the direction of Andre Gregory in 1972 and was inspired by both Alice’s Adventures in Wonderland and Through the Looking Glass. This original version of Alice was a seminal work for the period that met with international acclaim. It uses the original text by Lewis Carroll but takes of advantage of all kinds of theatricality and adds some dark twists and turns to Alice’s adventure including the insertion of Lewis Carroll at the bottom of the rabbit hole. THT's Young Company is a diverse group of young actors, many have been training with the THT faculty for several years. This year’s company is comprised of eighteen actors from the ages of 12-24 who create a highly physical performance that uses elements of contemporary dance, slapstick and commedia dell'arte. The production is directed by Kendra Gratton and Lindsay Pontius. An original soundtrack was developed by Jack Desbois, Josh Cote and Joe Plotts along with other local musicians. September 17 at 7pm, September 18 matinee performance at 2pm and evening performance at 7.. The production is suitable for families with children 8 and up. Tickets are $10/ $5. Reservations are suggested as seating is limited...email theoffcenter@gmail.com with "Alice" in the the subject header. Actor/storyteller/writer Dennis McSorley returns to the Off Center for the Dramatic Arts with his solo work, Typhoon of Tenderness, July 22 & 23, 2016. He debuted the work in March 2015 and has since showcased it at the United Solo Festival in NYC, and just last month at the Prague Fringe, where he was nominated for the festival’s 2016 Performance Award. Typhoon traces a life from brightness and success to despair and lost hope. A story he knows all too well. Steve Goldberg, known on the local jazz scene and a playwright too, adds original music to the piece. Rain takes place in early 1920’s Samoa. Amidst the spread of Christianity and the formidable presence of the U.S. Navy lies a deeply rooted native culture. Our Western protagonists find themselves confronted by this culture—drenched with rain, buoyed by their convictions, and plagued by their doubts. As island life strips them of their illusions, the line between sin and redemption, savage and civilized, becomes blurred. “The Gods of the Hills”. Written and directed by Lesley Becker. Tar Sands. Wind Power. Stealthy Deals. A small town fights back. 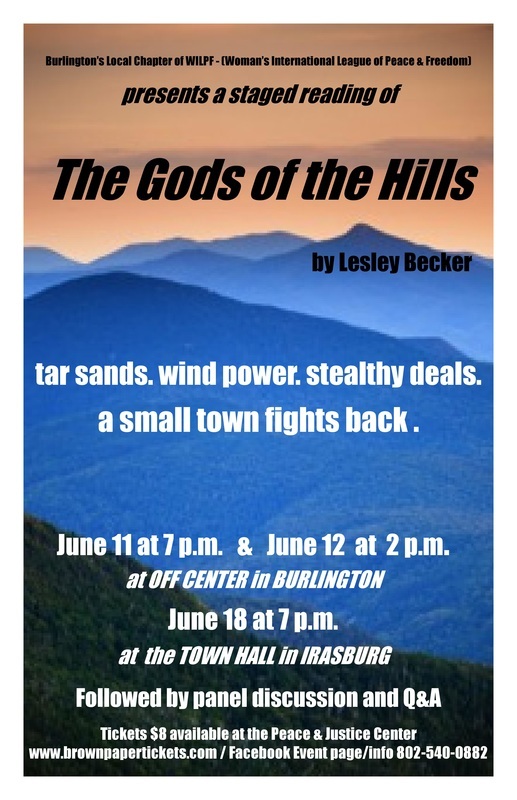 "The Gods of the Hills" taps into the hot button topic of energy production, from tar sands oil to ridgeline wind power. Staged readings on June 11th at 7:00 and June 12th at 2:00 pm at the Off Center for the Dramatic Arts in Burlington. Each performance is followed by a panel discussion and Q&A with the audience. Written and directed by Vermont playwright Lesley Becker. The cast includes Andy Krakow, Joseph Grabon, Grady Shea, Kyla Paul, Cynthia Seckler, Bob Carmody; stage manager Tess Holbrook. Sponsored by the Burlington chapter of WILPF (Woman's International League of Peace and Freedom). Tickets are $8 and available at the Peace and Justice Center, or online at Brown Paper Tickets. This drama reveals explosive dynamics in the intersecting lives of select board members and their families in a rural town, a environmental group's lead attorney, and a government official when both tar sands oil and wind power are slated to land in a small town. The play raises issues of environmental justice, and the loss of democratic process in small communities and how that is balanced against the urgent need for renewable energy. Four accomplished poets revel in the oral tradition with unique, dramatic readings. Each offers a fresh take on the world seen through personal and sometimes idiosyncratic lenses. J.C. Ellefson’s newest collection is Foreign Tales of Exemplum and Woe, published by Fomite Press. Jim’s skills run the range from fiddling, blacksmithing, farming to writing. Philip Baruth writes, “Only the bravest artists work so openly, and so triumphantly, with the obscure, the ineffable… This is an honest-to God feast, a groaning board. Come very hungry. Plan to stay very late.” Jim has published widely and currently teaches writing and literature at Champlain College, where he is the Poet-in-Residence. Jim and his wife, Lesley, direct the Champlain College Young Writers’ Conference, as well as own and operate Summer’s Gale Farm in Leicester, Vermont. In The Shady Sisters, Nancy Means Wright offers her readers a rich tapestry of women’s voices, young and old, bitter and hopeful, wise and otherwise. The poems in this collection are deftly narrative but never prosaic, with clearly drawn characters and language alternately beautiful and acidic. Informed by her Scots­ Irish heritage, Wright’s characters appear and reappear throughout to create a web of generational alliances. Wright has published poems in Green Mountains Review, Bellingham, Comstock Review, et. al. as well as three chapbooks, and in several anthologies. The Shady Sisters is her twenty-first book, published by Wind Ridge Books in April, 2016. David Cavanagh’s most recent collection is Straddle, out from Salmon Poetry of Ireland in 2015. Benjamin Myers wrote in World Literature Today that “Cavanagh’s best poems achieve not only clarity but also a poignancy that derives from simple wisdom expressed with great vividness and grace.” Earlier books include The Middleman and Falling Body, also from Salmon, and Cycling in Plato’s Cave, from Fomite Press. David’s poems have appeared in many journals and anthologies in the U.S., Ireland, the U.K., and his native Canada. He works for Johnson State College’s External Degree Program and as chair of Interdisciplinary Studies. Sharon Webster is a poet and a mixed-media visual artist. Her book of poems and art, Everyone Lives Here, was published by Fomite Press in 2014. Prior to that, Webster self-published six chapbooks of poems. “Webster’s poems, with their whimsical line breaks, are virtual paintings on the page. The reader will find a surprise in every line, a fresh, sensuous way of seeing and knowing.” Webster taught Word and Image, Studio Art and writing classes at Burlington College and Community College of Vermont. She has worked with developmentally challenged adults for many years. She lives and works in Burlington, Vermont. 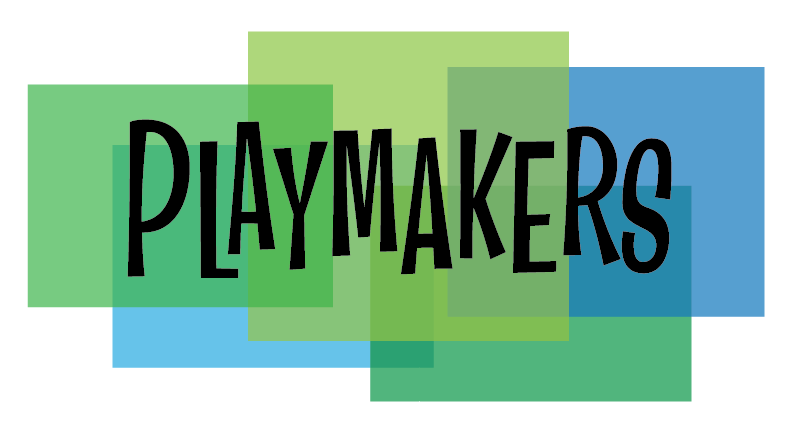 Join us on Monday, May 16th at 7:30pm for another round of Playmakers! New work by Kim Jordan and Margot Lasher, with a directed reading of a Mary McNulty play presented by Kevin Christopher & Patricia Julien. Hope you can make it! — with Mary Beth McNulty, Patricia Julien and Kim Jordan. ​J. Elan Cohen. 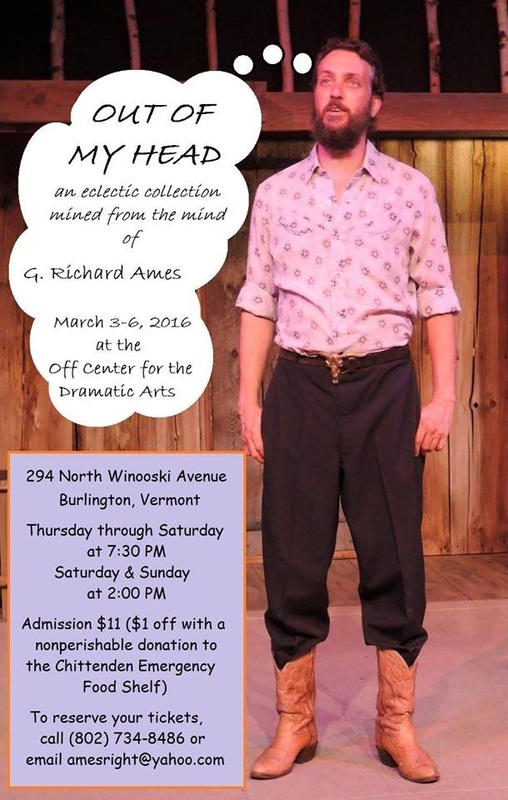 Chris Caswell & Kimberly Caterino will present a directed reading of a piece by Rick Homan. Fun times! 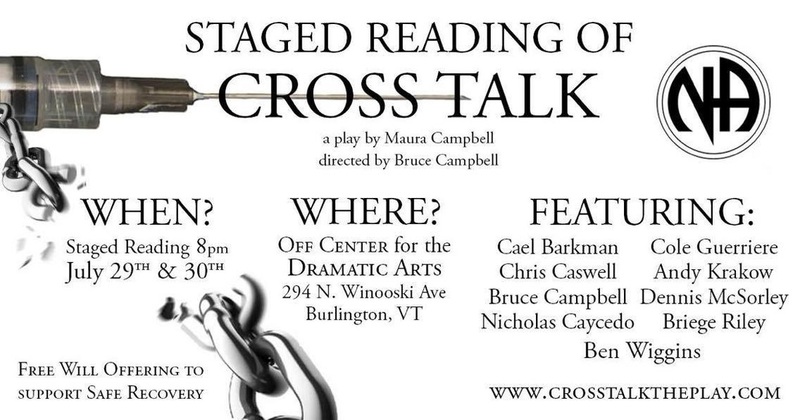 Directed by Eric Ronis, the reading is free and will be followed by a talkback with the playwrights and the cast. Eric Ronis’s monologue, “As Long As You’re Happy”, tries to make sense of what the purpose of parenting is from the various perspectives of Shakespeare’s Coriolanus, a New York Jewish mother, and a single gay dad. Eric is the Assistant Dean for Communication and Creative Media at Champlain College. The plays also feature Champlain faculty members Erik Esckilsen and Cinse Bonino, and Champlain College junior Dominic Rizzo. On Monday, March 21, 7:30pm we'll kick things off again! rick ames has been performing others' material for about 30 years...and during that time, he's also written a lot of songs and some scenes and monologues, which I've finally decided to share with you all. ! I hope you can make it! I promise a wordy but not-too-long family-friendly menu of fare, with a soupcon of innuendo! This is a lo-budget, lo-tech production, but I am happy to take reservations (even payment) at any time! Tickets are all $11 with $1 off if you bring a nonperishable item for the Chittenden Emergency Food Shelf. Tickets will be available at the door, and can be reserved by calling (802) 734-8486 or emailing amesright@yahoo.com. Cash or personal checks to G. Richard Ames will be accepted as payment.